Ahh, Santa Monica. One of the leading tourist destinations in California. This is for good reason. The city has so much to offer and is even more beautiful. Choosing a hotel can be tough, that is why we have made a list of our favorite hotels in Santa Monica. The shore easily tops the list in my opinion. This hotel is a classic and is loved by tourists and locals alike. 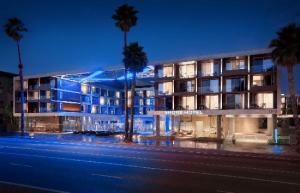 The Shore is a very sleek and modern hotel right on the Santa Monica beach. It has 164 Guest Rooms and 20 suites. It has one of the best locations in terms of things to do. One could easily walk downtown or to the beach, which are both favorites among toursits. For those who love going green, this hotel is very eco friendly. They have recently made the switch to going green, and have set the standard for hotels to follow in the coming years. Viceroy is a very modern hotel located in Santa Monica. It provides a very luxurious experience for those who wish to visit this wonderful city. It right on the beach and is an easy walk to everything you could want to do in this city. They have excellent amenities and are is very upscale. If you are looking for a very modern experience and a great vacation, you can not go wrong with Viceroy. The Georgian Hotel in Santa Monica is another favorite among tourists. For those looking for a more vintage experience, then the Georgian is for you. The Georgian is situated on the Santa Monica coastline and has been for the last 80 years. There is a ton of history in this hotel, and one could feel it when walking in. If you are looking to see Hollywood’s most famous, then look no further. There are frequent celebrity spottings at this hotel, and this is a tourist attraction in itself. This is a truly a perfect getaway. If you are looking for a getaway and a beach experience then you should consider Casa Del Mar. It provides an excellent experience for those looking for the classic beach getaway. It is situated on the beach and provides ton of fun for the whole family. You can easily walk to the beach or downtown, which ever you desire. You will surely have a good time at this hotel. If you are lucky enough to make it out to Santa Monica, you will have a great time. The hotel you choose will only make it better. There are so many different hotels to choose from, it can be tough at times. However, if you follow our easy guide, you will surely find the best hotel in no time.